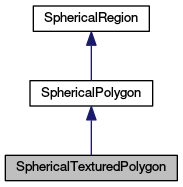 An extension of SphericalPolygon with addition of texture coordinates. Definition at line 800 of file StelSphereGeometry.hpp. Constructor from a list of contours. Definition at line 813 of file StelSphereGeometry.hpp. Definition at line 815 of file StelSphereGeometry.hpp. Return an openGL compatible array of texture coords to be used using vertex arrays. Definition at line 818 of file StelSphereGeometry.hpp. Serialize the region. This method must allow as fast as possible serialization and work with deserialize(). Definition at line 827 of file StelSphereGeometry.hpp. Set a single contour defining the SphericalPolygon. contour a contour defining the polygon area. Definition at line 837 of file StelSphereGeometry.hpp. Set the contours defining the SphericalPolygon. contours the list of contours defining the polygon area using the WindingPositive winding rule. Definition at line 833 of file StelSphereGeometry.hpp. Serialize the region into a QVariant map matching the JSON format. where the two lists are a list of closed contours, with each points defined by ra dec in degree in the ICRS frame followed by a list of texture coordinates in the u,v texture space (between 0 and 1). There must be one texture coordinate for each vertex.